The computerized SE-400 combination embroidery and sewing machine is designed to help you give your projects a customized, high-end look — all while being priced to fit your budget! Featuring 70 built-in embroidery designs, 67 built-in sewing stitches, 120 frame pattern combinations and 5 embroidery lettering fonts, the SE-400 is the perfect machine for all your sewing, embroidery, crafting and home décor projects. Computer connectivity allows you to enjoy future machine updates and easily import and digitize embroidery designs directly from your computer. 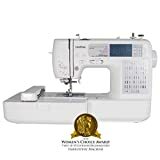 Features like the automatic needle threading system and backlit touch screen LCD display make working on the machine easy on your eyes, while the Quick-Set™ drop-in top bobbin, easy bobbin-winding system and built-in push-button thread cutter add a new level of convenience to your sewing and embroidery crafting. With an impressive assortment of included accessories, the SE-400 is truly an affordable, feature-rich choice for the budding fashion designer.